Architects Concept: TCosy™ can retrofit buildings of any size, shape or design. Your Architect designs the future vision of the current building. Building and Energy Assessment: Beattie Passive undertakes a building assessment to check for structural faults or damp. Energy assessments are completed to understand the current energy efficiency and energy usage data. Beattie Passive 3D design: Architects designs are fed into the Beattie Passive design system and are 3D modelled. Engagement with the resident: Residents are fully engaged on all stages of the Retrofit process gaining their buy-in and commitment to the project. Contractor completes Retrofit: Beattie Passive certified contractors manufacture and erect the TCosy™ frame and system, fit passive standard windows and doors, install MVHR and fit external finish. On-site compliance checks: Every Retrofit is tested at structural completion including structural compliance, thermal continuity testing and air testing. Beattie Passive Certification: Beattie Passive undertake detailed checks to ensure the retrofit is delivered as designed. Completed Retrofit: Delivering a new energy efficient, healthier, more comfortable home. 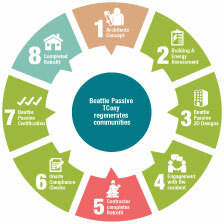 Regenerates the local community: When retrofit is delivered at scale whole communities can be regenerated. "We have designed the Retrofit process to be as simple and efficient for all parties involved."